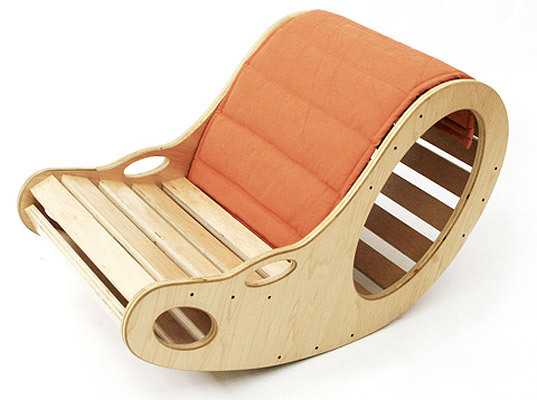 Part of Knoend’s Bean Rocker Series, the Fava is more than a low, kid-friendly rocker lounging in. The multitasking recliner can also serve as a meditation zafu, a back-bracing support, or an exercise balance board for the rest of the family. Made in the United States from Forestry Stewardship Council-certified maple plywood and finished with linseed oil, each rocker is padded with an organic cotton cushion in your choice of orange, chocolate, or green. We’re positive your toddler won’t mind sharing — just as long as you remember to ask nicely. Part of Knoend's Bean Rocker Series, the Fava is more than a low, kid-friendly rocker lounging in. The multitasking recliner can also serve as a meditation zafu, a back-bracing support, or an exercise balance board for the rest of the family. Made in the United States from Forestry Stewardship Council-certified maple plywood and finished with linseed oil, each rocker is padded with an organic cotton cushion in your choice of orange, chocolate, or green. We're positive your toddler won't mind sharing � just as long as you remember to ask nicely.